As you walk down narrow alleyways lined with aging brick buildings, its impossible to not feel enchanted by the city of Bhaktapur. 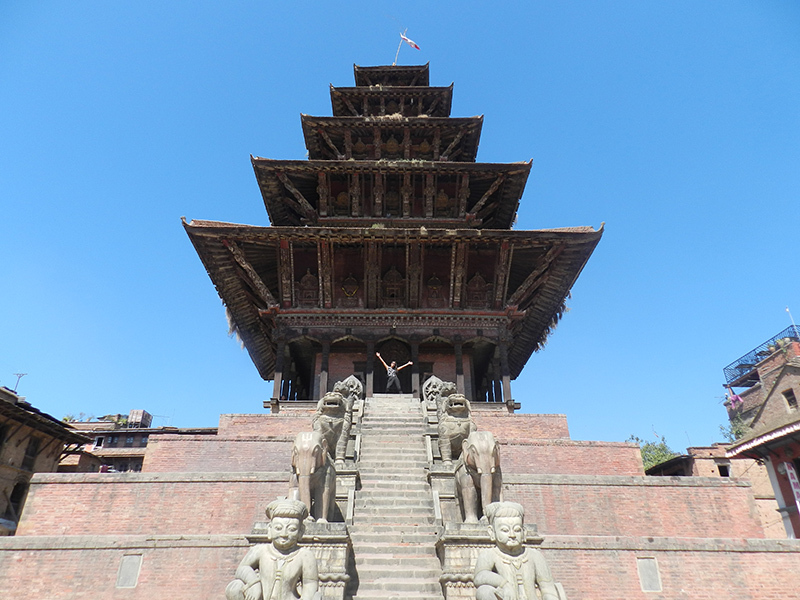 Bhaktapur is one of the three royal cities in the Kathmandu Valley, along with Kathmandu and Patan. Only an hour’s drive from Kathmandu, it makes for an easy day trip. Because it boasts the most temples per square foot and is the hub of Newari handicrafts, it has been nicknamed ‘Nepal’s Cultural Gem.’ The city preserves its olden glory by prohibiting the usage of cars within the city proper. Besides admiring the many of works of art from wooden carving to terracotta pottery, you can survey traditional Newari architecture and spend hours relaxing in a number of charming coffee shops. For historic conservation efforts, a steep 1500 NPR ($15 USD) entrance fee is requested upon entry into the city that is valid for seven days. Passport is required. A yogurt-esque treat made from sweet buffalo milk that is traditionally spiced with cinnamon and cardamom that Bhaktapur is known for. In Nepali, it is called ‘juju dhau‘ which literally translates as “the king of curds.” Thus, it also goes by the name of “Royal Curd.” I made it a daily ritual to get my curd, sometimes twice a day depending on how hungry I was between the 10:30 am serving of lunch and the 7 pm serving of dinner. Quite thick and having a distinctly rich taste, the curd I ate was sourced from a shop only frequented by those having the knowledge of its whereabouts. 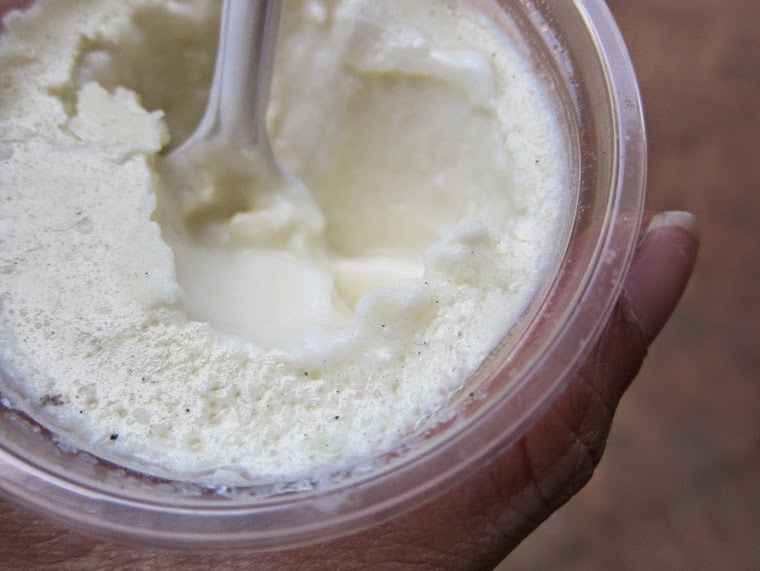 It was my favorite snack and without a doubt, the best curd I tasted while in Nepal was Bhaktapur’s finest. About 20 minutes by bus north of Bhaktapur is a rural historic village called Changu Narayan. In the local language, it means “God’s Village,” a fitting name given its geographical position perched high on a hilltop that overlooks all of Kathmandu Valley. 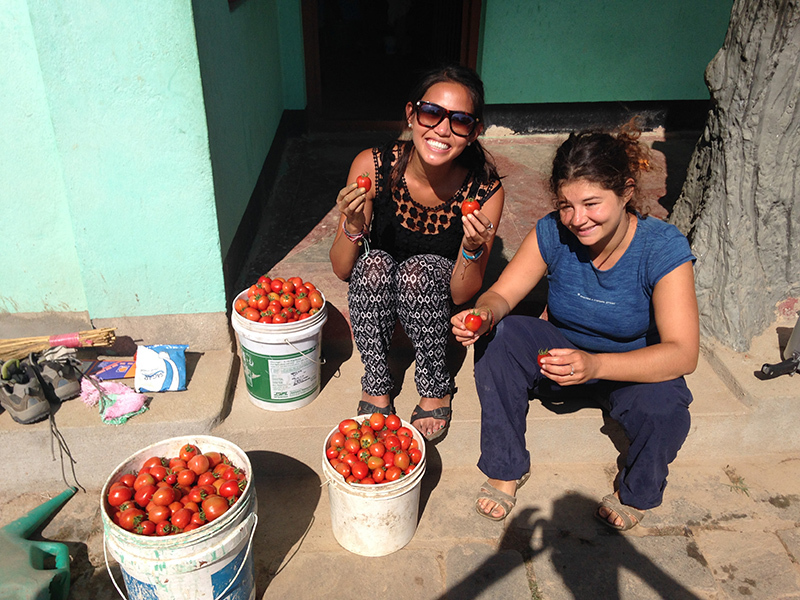 It was there that I was given the opportunity to experience daily life with a native Nepalese family. Dhruba KC is a village local who runs a guesthouse called ‘Village Villa’ where he invites volunteers to help maintain his household and in return, he teaches them about the Nepalese way of life. It was by far the best ten days of my trip in Nepal. I engaged in cultural exchange everyday, met a great group of like-minded travelers who became family to me, and was humbled by the amount of hospitality offered. I highly recommend going the homestay route. You will be surprised at how much more meaningful your journey becomes when you actually start to considering a place as home. You’ll see artists-at-work in their shops anywhere you walk through in the “Living Museum.” While in Bhaktapur, we were invited to watch novice painters add the finishing touches to their first Thanka artwork. Thanka is a colorful painting painted on either cloth or silk that depicts aspects of Buddhism such as sacred mandalas or the wheel of existence. 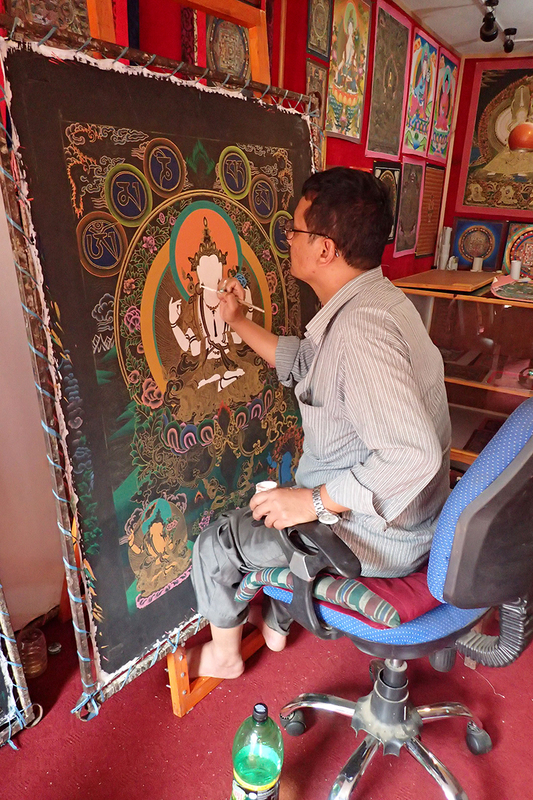 All around Bhaktapur, art schools offer Thanka workshops to anyone wishing to learn this ancient practice. On top of a history lesson and a fundamentals course, you are allowed to bring your very own work home as a special souvenir. Most establishments refer to thankas as “a gift to your soul”, touching upon its very spiritual associations. While less popular than the neighboring Durbur Square, Taumadhi Square is home to Nepal’s largest pagoda temple, Nyatapola (or Nyatpol). The temple, built in 1702, is dedicated to Laxmi, the Hindu goddess of wealth and prosperity. The multi-roofed temple offers a fantastic view of the square and all its shops and during the weekends, the square is teeming with locals and visitors alike, making it a great place to people-watch. The stone stairwell leading to the top of the temple is flanked by statues of legendary beings at each step. Once you make your way up, you feel rather untouchable towering over the rest of the world below. Pottery is one of mankind’s most enduring traditions. 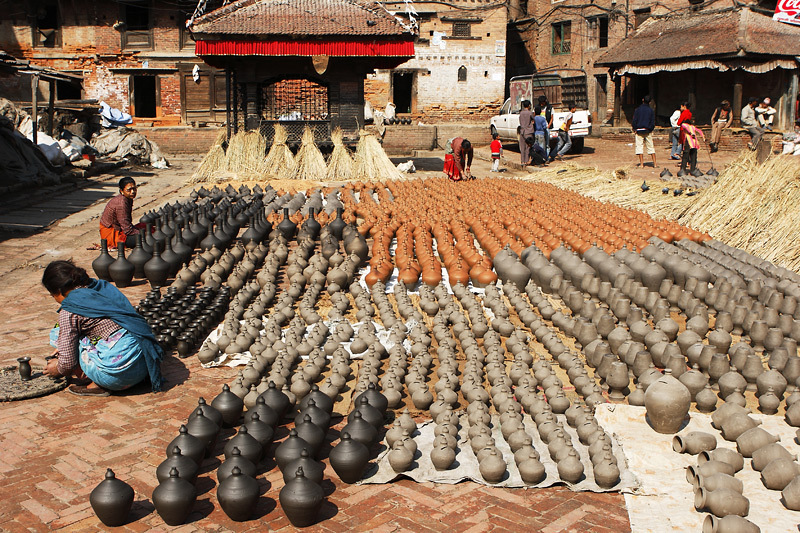 In Bhaktapur, you can see just how withstanding this tradition still remains at Pottery Square. From here, the whole process of creating ceramics out of clay can be traced with potters breathing life into shapeless mud on their traditional wooden wheels while others leave their finished pieces to bake under the hot sun. Its a beautiful sight to see as no signs of modernization seem to influence the time-tested creative process of the earthenwares sold here. Its best to visit during a sunny day when the square seems to be ablaze with action and productivity. Beans Coffee Shop, tucked away in the corners of Durbur Square, is a cafe whose menu includes panini-pressed grilled cheese, honey-laden cafe mochas, and thick brownie slices. If the affordability wasn’t enough, the hi-speed wifi (for Nepal) will make you stay.  Bhaktapur, Nepal is one of my favorite destination but is there anything I’ve missed? Comment below!